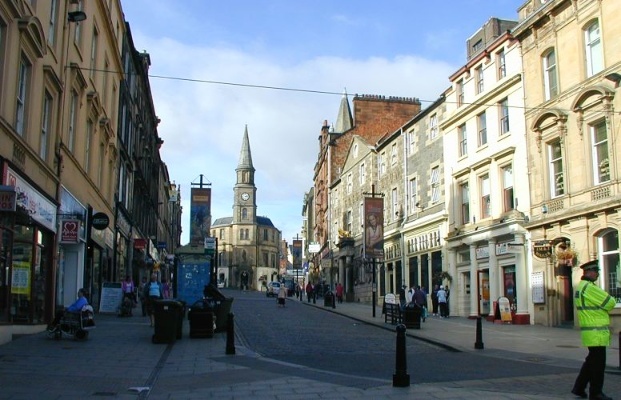 Stirling High Street @ High.St - High Street shops and High St businesses. Large Google map of Stirling High St.
Stirling is strategically placed between Edinburgh and Glasgow and to the North. With its own university, rich history and abundance of good shops, Stirling is a great place to visit. Stirling Castle, the Wallace Monument and the Bannockburn Heritage Centre are the main attractions but there are plenty more, such as Kilmahog Woollen Mill. Since the release of the film 'Braveheart' with Mel Gibson, Stirling has become a popular destination for those interested in the bloody history between the Scots and English. The Castle houses a historical reconstruction where you can relive the movie experience through staged battle scenes. Details about these and other attractions can be found on: Stirling OnLine, Stirling Tourism and the Visit Scottish Heartlands web sites. Detailed maps and information are available from RPA Smith Street Maps. The main shopping area in Stirling is well defined, easy to get around and mixes open streets with a large under cover complex called The Thistles. We start from the top of Barnton Street and come down through Drummond Rd and Murray Place into Port Street. Looping out from Barnton St to the West and back down to Port St are the pedestrianised areas of Friar Street, Baker Street and King Street. To the East of Murray Place and Port Street is the Thistle Centre with its nearly 100 shops listed.